All pregnant mommas– even experienced ones– prepare for and worry about the laboring pains of childbirth. It is a monumental day in a woman’s life, where you learn to go deep within yourself to draw the strength needed to bring forth your child. During pregnancy, you may seek out methods of breathing, relaxing, read books, and perhaps even hire a doula to help you cope. And yes, the laboring pains do end in the glorious moment when your baby is born and placed on your chest for skin to skin bonding. But, your uterus’ job isn’t done quite yet. After the baby’s birth the placenta will be released, which may cause a few moments of mild contractions, but you’ll likely be distracted by studying your new baby to notice it much! Even still, there will be about three days following birth that will feel similar to labor in some moments, especially when nursing or if you’ve had a baby before, only with the reward already in your arms! Your uterus still has to shrink down back to its pre-pregnancy size (which, in total takes about six weeks). Thankfully only the first days of postpartum tend to have the contractions that are noticeable as they are at work to shrink your uterus and control bleeding. Don’t be afraid though! ﻿There are a few things you can do to help cope and to keep in mind as you prepare for your postpartum recovery. While you may be wishing your doula could come back and help you through these random contractions, remember it is short lived. There is an end in sight, just like when you are in labor and are reminded that your baby will come out eventually! Remember that it has an important function, just like labor pains to bring your baby down and out. Keep comfortable while you wait it out. Heat is very soothing to the cramping sensation, just like with a period. Keeping an electric heating pad nearby for when it is needed can be very helpful while you rest. You can also use a rice sock heated in the microwave or take a bath if you feel up to it. Herbal teas and tinctures can be very beneficial to help the after pains. One tincture moms rave about is After Ease by WishGarden. While it may not taste amazing, adding it to your water to sip on throughout the day (because new mommas have to stay hydrated anyway!) will make it easy to dilute and barely taste. Red Raspberry Leaf Tea you may have heard about to drink during pregnancy to prepare your uterus for birth, but it’s also wonderful for after birth to help it shrink back down! Nettle Leaf Tea is another great one to soothe after birth pains, help slow postpartum bleeding due to its Vitamin K content, and encourages breastmilk supply. Birth truthfully is a traumatic experience for our babies, no matter how beautiful it is! It goes through a lot to bring your baby into the world and your body may feel every ounce of that after birth. Arnica can be great for the after pains as well as any swelling, bruising, and general aches during the initial postpartum days. It is recommended by the British Homeopathic Association to take a 30C tablets three times a day for the after birth pains. If you find the natural remedies don’t work for you, there is no shame in taking some pain medications as needed to be able to rest comfortably. You shouldn’t need to take them for long! 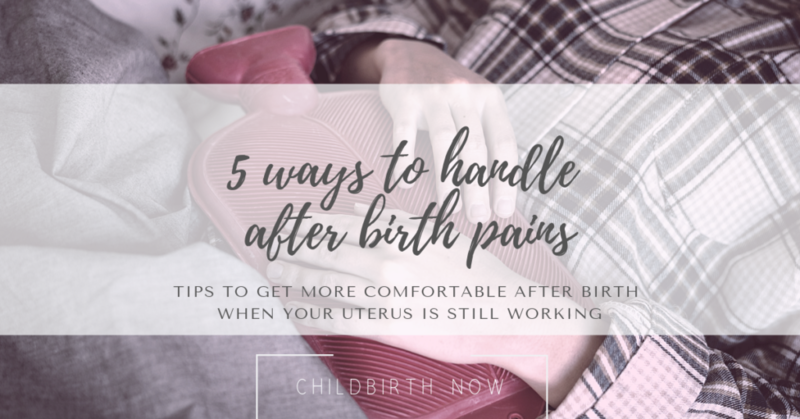 Having a few coping methods available to you for the after birth pains will give you the ability to try different things that may work best for you. Don’t forget to prepare for your postpartum healing care when you are preparing for labor and your baby’s needs! Sign up for updates, maternity workshop schedules and the latest trends in maternal health!